Not so hidden in the depths of the Hard Rock Casino, Vibe is sophisticated yet edgy. Modern chandeliers hang from the ceiling and a fire burns atop the large circular bar. 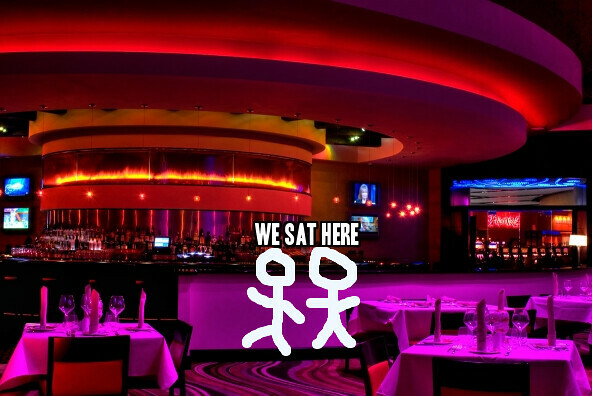 Without reservations and a booked guest list we were offered seating at the bar. *shrug* No biggie! So glad we did! It was much less formal and the bartender and sushi guy were fun. Starters: Pinot Noir (can rarely go wrong), Fried Green Tomatoes topped with jumbo lump crab meat and remoulade sauce. You don't see pictures because we devoured it. Way to prepare southern garden cookin' "couture"! We also ordered calamari. Very tasteless but it's hard to impress me with calamari after having the BEST in South Africa. The dipping sauces were also tasteless. Dinner: they have an entire section of the menu of "American" food and an entire section of sushi. I had the John Wayne Roll and the Hard Rock (pictured above with calamari to the right). Super tasty!! John Wayne Roll: spicy tuna avocado and tempura jalapeños, topped with crab, ebi and spicy mayo. 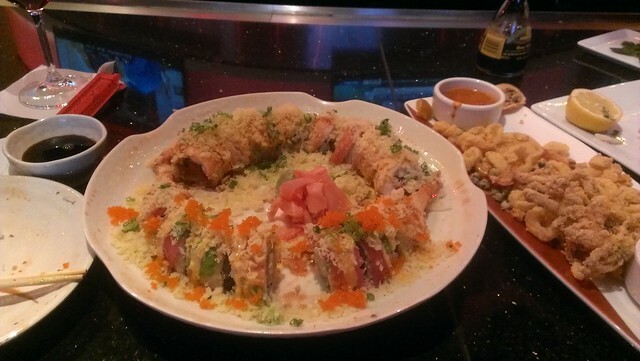 The tempura jalapeños took this roll to a whole new level! So yummy! Hard Rock Roll: shrimp tempura, crab stick, cucumber and cream cheese topped with avocado, tuna, ebi, eel sauce and sriracha. A huge success. Delicious! My dinner date had the slow braised beef short ribs. In a Chianti demi-glaze, they were melt in your mouth delicious! I asked for a small bite and then wanted to eat the entire dish! 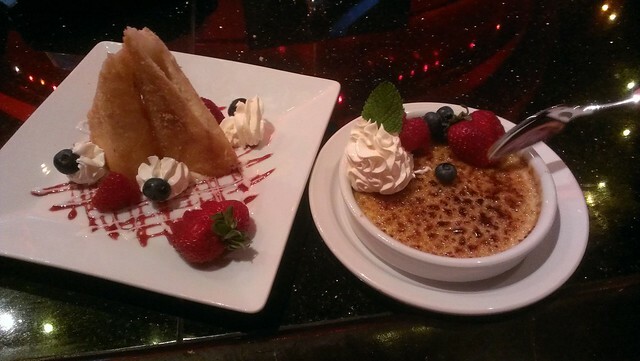 Dessert: fried cheesecake and creme brûlée. Both were uber sweet! The creme brûlée tasted like burnt marshmallow. Dinner date, "Good, that's what it's supposed to taste like!" I wasn't a fan. But my date found it to be "divine". DIVINE!! That's a classy word for dessert. But I suppose with a name like creme brûlée (all those fancy marks show up automatically, thank you MacBook!!) it deserves a classy remark for taste... As far as the fried cheesecake, I learned I'm not a fan of melty cheesecake. Cause that's what happens... it gets kinda all melty and soft and warm. I like solid cold cheesecake. In fact, it's my favorite. I'll have mine NOT FRIED from now on. But dinner date says, "I'll have mine fried." So it's a win for both desserts! Overall the food was good and we couldn't beat the price of free. If it weren't free, it was going to be around $100. Of course, we got a ton of food. But looking at the menu, they really don't have bad prices. Vibe is a great restaurant for date night. Especially if you're in the mood for sushi and your dinner date isn't. The atmosphere at the bar was relaxing yet classy. The bartender was sweet and fun; as was the sushi chef. If I gave thumbs up, it would get both of mine. "I'd add that the food is only as good as the company you spend it with."